September 28, 1870, a Wednesday, was a signal day in the history of Middletown. On that day alone, ten deeds were registered for the sales of properties on the Rancho Callayomi Spanish land grant. 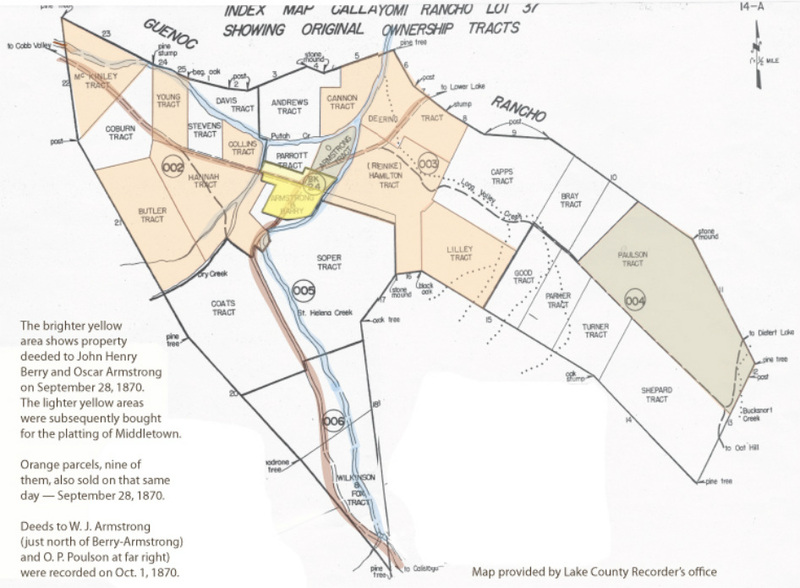 For the previous fourteen years, the rancho’s 8,242 acres, along with the Rancho Guenoc’s 21,200 acres, had lain idle, awaiting probate of the estate of Capt. A. A. Ritchie. Ritchie had been found dead in the road alongside his wagon in the summer of 1856. Judging only by the indexing of deeds, the first buyers were Oscar Armstrong and John Henry Berry. Jointly the two paid $237.50 for 47.4 acres at the crossroads area we now think of the junction of highways 29 and 175. Berry is credited with building the first house in Middletown, Armstrong its first saloon. Berry and Armstrong soon purchased parts of the properties to the north to bring their holdings to 80 acres. This became home to Middletown. William Gray Cannon and Charles Marsh Young. Deeds were also issued to S. G. Butler; R. S. Deering; two deeds to John M. Collins and one to as-yet-unknown-given-name Lilley. C. M Young bought out the interests of his brother-in-law in 1871 and formed a commercial partnership with Oscar (often known as Bing) Armstrong. They contacted B. R. Wardlaw, who was widely admired for having surveyed and platted Sacramento, to lay out the new town. South Lake County residents will recog- nize familar surnames among these early pioneers. bought 140 acres adjoining Berry and Armstrong's on the north. This all took place at a strategic location five miles south of Guenoc. Enterprising young George Farley set up a livery station here as a midway point for providing fresh mules or horses to passersby. By 1867, Lawley Toll Road was nearing completion. At that same time, two ambitious young men were building a road that spurred off into the mountains to the west, to Harbin Springs. The hot springs resorts in Calis- toga were already achieving wide-spread publicity and drawing scores of visitors from around the world. The new owners of Harbin opened their resort in 1867 to try to capture some of that business. so strong demand for housing and after-hours recreation was anticipated. Many residents and businesses of Guenoc — but not all, as so widely reported — moved to Middletown. Multiple sales to many, such as Poulson, appear among recorded deeds, making it unclear whether the original boundary lines or consolidated parcels are shown.